The trailer for An Evening with Beverly Luff Linn is here and it's a bit bizarre, to say the least. 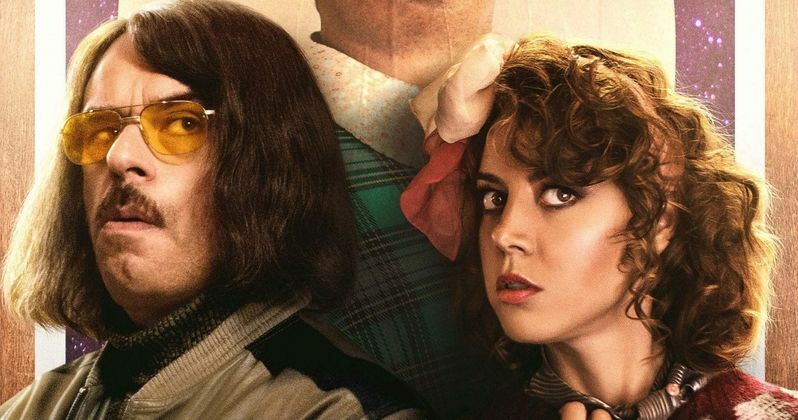 The movie is directed and written by Jim Hosking (The Greasy Strangler), and stars Aubrey Plaza, Jemaine Clement, Emile Hirsch, and Craig Robinson. Plaza plays Lulu Danger as her unsatisfying marriage takes a turn for the worse when a mysterious man from her past comes to town to perform an event called "An Evening With Beverly Luff Linn; For One Magical Night Only." According to the actress, the movie becomes a weird love"quadtrangle." Aubrey Plaza is Lulu Danger, who lives in a small town and according the actress, she's "a woman with big dreams." However, the trailer really doesn't come out and say that. In fact, it's a pretty broad mashup of scenes that looks incredibly weird, but at the same time very intriguing and mysterious. Plaza had this to say about An Evening With Beverly Luff Linn. "She's in a terrible marriage, and has so much more to offer in life, and is confronted with her first love, played by Craig Robinson, who shows up in her small town, and she goes after him. It becomes a love quadrangle between me, Craig Robinson, Jemaine Clement, and Emile Hirsch. So wrap your mind around that. Me, and all these ridiculous men!" In addition to the aforementioned love "quadtrangle," there's a lot more going on underneath the surface. An Evening With Beverly Luff Linn also features some criminal hijinks when it's discovered that Lulu Danger's scheming husband, Shane Danger (Emile Hirsch) and his crew, have stolen from her adopted brother. A specialist, played by Jemaine Clement, steps in to help hunt down the stolen goods and also begins to fall in love with Lulu. While the trailer for An Evening With Beverly Luff Linn is pretty random, it showcases the strengths of the cast. Craig Robinson's Beverly Luff Linn doesn't say anything in the trailer, but he doesn't have to, everything is expressed through his facial movements and eye contact. Emile Hirsch, who is shown in a ridiculous blonde wig, gets into Three Stooges territory with his criminal cohort. And Aubrey Plaza obsesses over Robinson's Linn character. There are also some Coen Brothers elements featured in the short trailer. An Evening With Beverly Luff Linn hits select theaters on October 19th and will also be available for streaming on VOD on that date. The movie premiered at the 2018 Sundance Film Festival to mixed reviews, which makes sense since it came from the director that delivered The Greasy Strangler, a movie that contains intense vulgarity. However, An Evening With Beverly Luff Linn looks to be a bit on the tame side when compared to Jim Hosking's last outing. You can check out the trailer for An Evening With Beverly Luff Linn below, thanks to the Love Indie Films YouTube channel.